Are you ready to truly meet yourself? 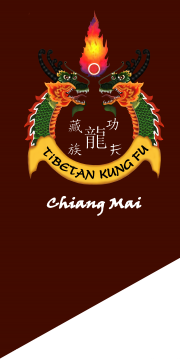 KUNG FU CHIANG MAI originates from a 600-year old martial arts Tibetan, Mongolian and Chinese lineage. The school's objective is to teach the arts of self-defense and healing to those who wish to acquire and maintain physical and spiritual well-being. A holistic approach focusing on body (forms, exercise, agility and flexibility), mind (concentration, mindfulness) and spirit (energy flow, meditation, inner peace) is used to balance the whole being and improve life at all levels. I came to Chiang Mai about a year ago and started to study Kung Fu at Kung Fu Chiang Mai with Master Jade. I was so impressed by his approach that I decided to stay in Chiang Mai for a couple of years and study with him and Master Kai. For Jade, Kung Fu is much more than a self-defense or fighting technique. He sees Kung Fu everywhere and always makes comparisons between Kung Fu and real life. After studying with him for over a year, I am still astonished at his knowledge and understanding and the more I learn, the more I know I still have a long way to go. Jade often tells me “The basics are the more important. Learn them well and then you can learn all forms easily and truly master them. But if you don’t have a good grasp on the basics, then your forms may look good, but they will be empty.” Jade’s teachings are personalized; his approach is different with each person and he is equally good at teaching beginners, who just come to experiment for a few times, as he is to teach high-style. For me, studying with him is a life-changing experience. And Master Kai contributes to it with her knowledge and gentle approach to teaching Tai Chi, Qi Gong and some Kung Fu forms. I have been training with Master Kai at Kung Fu Chiang Mai since 2008. I return every year to review my previous training and continue learning new Tai Chi forms and styles. We train in a traditional wooden dojo, which is a very natural and harmonious environment. Master Kai is a very relaxed and kind teacher. She is extremely knowledgeable and experienced. I usually stay in Chiang Mai for one month and take one of the 30-hour courses, which are inexpensive and comprehensive. I started studying Tai Chi Fan at Kung Fu Chiang Mai because the form looks so cool. After practicing for a short period of time, I noticed that I was beginning to feel Chi. I decided to continue my studies with other forms of Tai Chi. My experiences with feeling energy or Chi increased as I took more classes and continued to practice. Then, I started taking Qi Gong classes and my experience with Chi deepened. Before coming to Kung Fu Chiang Mai, I studied and practiced Tai Chi with three other instructors and also practiced aikido and judo for years. Never before had I experienced the existence and movement of Chi as strongly and consistently as I have after studying with Master Kai. It has helped me improve my technique in energy medicine, meditation, massage and aikido. It has improved, directly and indirectly, my health in general, my flexibility, my strength and mind. © 2019 Mon blog. All Rights Reserved.